This popular dessert has stood the test of time. Fresh raspberries give great fruitiness, but jam can be used instead. As long as the sponge has been rolled when hot, this can be made 4-5 hours in advance and filled when required. 1. Preheat the oven to 200°C, gas mark 6. Grease and line a 32 x 23cm Swiss roll tin. Sprinkle with vanilla dusting sugar. 2. Whisk the eggs, vanilla extract and sugar in a large heatproof bowl to combine. Place over a pan of simmering water and whisk until thick enough to form a trail. Remove the bowl from the heat and continue to whisk for 1-2 minutes until thick. Gently fold in the flour and pour into the tin. Bake for 10 minutes. 3. While still warm, upturn the Swiss roll onto a large piece of baking paper sprinkled with vanilla dusting sugar, roll up and allow to cool. 4. To make the filling, mash the raspberries and the caster sugar together with a fork and set aside. Whisk the butter with the icing sugar until the mixture is pale. 5. 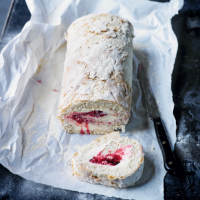 Unroll the Swiss roll, spread with the butter icing and then the raspberries. Roll up and serve.